You can breathe easily when your sinuses are clear. But if these air-filled cavities are blocked, this can make it slightly harder for breathing. The inflammation of sinus infection can be very bothersome, though it usually is mild and will response with lifestyle measures. For example, it may smell like feces – why? How do you get this sinus infection? 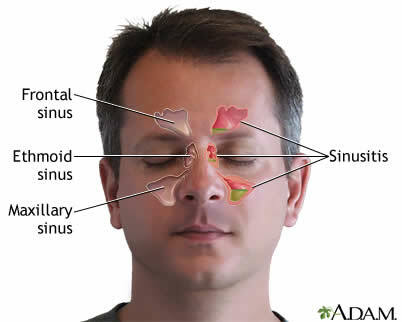 Sinuses are small, air-filled cavities (nasal passages) that can be found behind your forehead and cheekbones, see the image below (credit to ADAM). Sinus infection a.k.a ‘sinusitis’ is a condition in which sinuses get inflamed due to infection. The inflammation can lead to obstruction for the mucus that normally drains into the nose through the nasal passages. The problem can make lots of things quickly go from bad to worse! Once the infection occurs, the body kicks into action with what’s known as the body’s immune response. While it is a natural mechanism of your body to fight the infection, this beneficial process can sometimes make you feel more miserable. For example, the overactive immune system may make the symptoms of sinusitis worsen at night! To fight the infection, your mucus-secreting glands turn into overdrive, producing mucus higher than normal. At the same time, the blood vessels dilate as the mucous membranes swells – and white blood cells enter to fight against the infection. There are also a variety of substances released to stimulate the inflammatory process. Unfortunately, a full-blown case of sinus infection usually worsens before it improves. To cope with the problem, the natural mechanism of the body stimulates the sinuses to become more inflamed. But before it gets better, the sinuses will get more swelled. 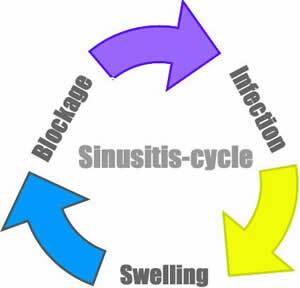 This can lead to more blockage and create friendlier environment for bacteria to overgrowth – and you’re stuck with sinusitis-cycle. The good news, sinusitis is usually not serious. Many times, it will improve with rest and liquid within a few days or weeks – or even sometimes it may improve on its own. Once the blockage and inflammation diminish, the drainage of your sinuses will return to normal and you should breathe freely again! Sinusitis can be attributed by a number of different causes. But in general, it is usually caused by three main categories; genetic, environmental, and anatomical factors. Primary ciliary dyskinesia that can lead to defects in the action of cilia. Disorders that weakens the body immune system. If your immune system doesn’t work as well as it should, you’re more vulnerable to develop infection. Cystic fibrosis. This disorder can affect cells that make mucus. Exposure to tobacco smoke, air pollutants, or particular chemicals. In some cases, the problem may be triggered by very dry indoor heating system. Colds, allergies, or exposure to microorganisms in your environment (such as fungi or bacteria) may also contribute to trigger the infection. Some people are more vulnerable to have sinusitis because they have the following anatomical disorders: nasal polyps, nasal fractures, deviated septum, scar tissue, or tumors (in rare cases). How does sinus infection smell like feces? Your doctor will usually be able to determine whether or not you have sinusitis by examining the inside of the nose. The symptoms that you have can also help diagnose the underlying cause of your problem. There are a number of symptoms that you can experience when you have sinusitis. The main symptoms include nasal congestion, pressure or pain over the affected sinus, and difficulty breathing. Yellow /green discharge from the nose. Cough, this usually worsens at night. 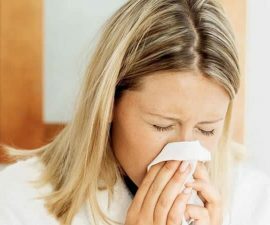 Fever, it can be a vague symptom of many health conditions, including sinus infection. Frequent coughing, nasal congestion, and more energy required to fight the infection can lead to tiredness. Sore throat, the more acidic mucus triggered by the sinus infection may irritate your throat’s membranes. Some people may also find the problem smells like feces, why? Sinus infection can affect your smell in several ways. 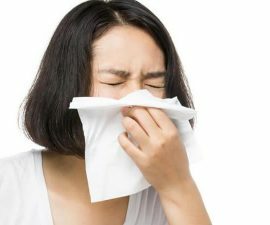 But although smell change can sometimes be very bothersome, this symptom usually will improve as the infection relieves and the inflammation gets better. How Long Does Sinusitis Last in Pregnancy?